We have a request from our users. Custom Entity named ASSET which has phone call activities created and Assigned to Teams. Assigned to the user in the WMR field on the Contact Record or Assigned to a team if that field is blank. How can we have the phone call regarding the ASSET and assigned base don information on the CONTACT? Appreciate any thought and suggestions. This should be doable both in a 'classic' workflow and in a flow. In the classic sense, you can use the Dynamic Values control to set the owner to the custom field from the contact record. You can just put a condition in to check first if this field contains data. If it doesn't you can assign to a static team. Be careful with assigning to static teams though as by putting the value in the workflow definition you're actually binding to the team identifier, which may be different in different environments and may cause your workflow to not publish. There are a number of 'Get Team By Name' custom workflow assemblies out there for you to use, which allows to fetch the team identifier at runtime which gets around this problem. In a flow it's a bit tricker, as a) there is no 'Contains data/Does not contain data' condition (but here is the workaround), and b) in the condition where you're assigning the team you'll first need to get a list of teams which match that name, and then set the value to the first item in that list. But yeah, sounds do-able to me. I'd normally put a better answer with screenshots but I am on dire wifi in Amsterdam airport. ​Thank you and Safe Travels! Just to add a little more to this, you can always make one 'jump' when trying to get data from related entities in workflows (without making a custom workflow step through code). In this case, you're starting from the Asset and want to get the WMR from the Contact, not a problem at all. Now if you wanted to get some other pieces of information from the WMR, that would be a problem since you'd be going from Asset -> Contact -> WMR. 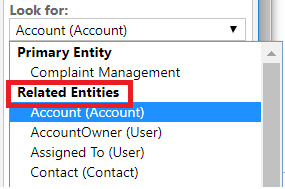 The field listing will then change to show the fields from the Account entity that fit the given field you're trying to populate.